Once your shell finally finds a target and punches it's way through, the enemy experiences a 'significant emotional event' in the form of damage. You have the potential of doing both hull damage, and module damage. the hull has it's own hit points (displayed in game) and once those are exhausted, the tank is considered destroyed. We'll cover module damage in the next article. Each shell in the game has it's own damage potential. The client will differentiate between hull damage potential and module/crew damage potential. When it comes to hull damage potential - this is displayed in game as the 'alpha' or the average damage attribute of your shell. This means that when this shell damages a vehicle hull, the potential damage is + or - 25% of it's average damage. The damage you roll is then subtracted from the hit points of the vehicle you hit and penetrated. 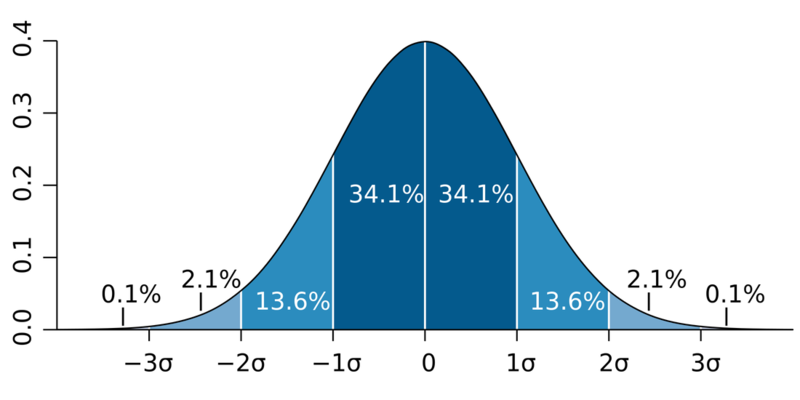 This RNG is also based on a Gaussian (normal) distribution similar to the penetration and accuracy RNG. Red is gun damage, and hull health. Blue is module damage and module health. These shells will only damage if they penetrate the armor. If the armor is not penetrated, then the entire damage potential is mitigated. Once the target is penetrated by any of these shell types, then the target suffers the entirety of the alpha damage + or - 25%. No other factors play a role in the damage calculation. There is no damage difference between barely penetrating, or easily penetrating a tank, the damage and it's RNG is the same regardless of penetration potential after the hull has been breached. ​I'm certain there are many tankers out there that run full HE load outs and have no idea why some shells do loads of damage, and some do 0 damage. HE shells differ greatly from the types we've already talked about. HE shells will cause damage from a penetration, from a non-penetrating hit, and sometimes can cause damage from a miss! NOTE - HESH (High Explosive Squash Head) and HEP (High Explosive Plastic) are the same shell with different names. This ammunition type is typically characterized in game as having higher penetration than traditional HE. The chemical munition of HESH works differently than HE does in real life, but in WoT HESH operates exactly the same as standard HE rounds - they simply have higher penetration. There are few things in World of Tanks that are more rewarding than successfully penetrating an HE round because you purposefully chose to fire it based on your knowledge of armor models. When an HE shell manages to penetrate, then the damage calculation is exactly the same as described by AP, APCR, and HEAT. The damage done to the penetrated tank is + or -25% of the alpha of that HE round. Remember that during this penetration test HE rounds have no normalization, and do not benefit from the '2 calibers' and '3 calibers' rules. Typical HE shells have very low penetration, and will detonate on the outside of a tank. Rays are drawn from the point of impact to all armored surfaces with in the blast radius (direct line of sight) and the game automatically chooses the ray that inflicts the most damage based on the equation below. The tank then suffer's damage based on this selected maximum damage result. 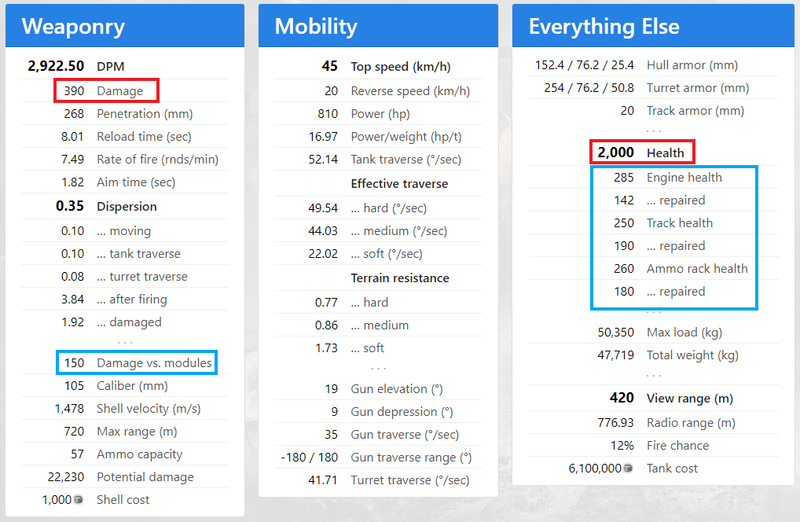 Generally the game will be selecting a ray that has lowest impact distance, and the lowest armor thickness of all points with in the blast radius. Since the armor (after it's multiplicative factors) is subtracted from the alpha, this does mean that the actualDamage can result in a 0 or negative value. When this happens it is treated as bounced damage and the entire HE damage is mitigated. Note - It is unclear whether the RNG roll is given to the Alpha prior to the equation being run, or to the actualDamage after the equation is run. If the RNG roll is given to the Alpha value, then the RNG spread between min and max will be a little higher than if the RNG roll is done to actualDamage. We are going to look at the math in detail between a T49 and a Conqueror, and how the HE shell interacts based on all possible scenarios. In all of these scenarios the Conqueror does not have a spall liner equipped so the SpallCoefficient will always be equal to 1. When the T49 fires it's shell at the rear of the Conqueror it will penetrate. In this instance the shell goes through normal penetration test as described in the last article. It will then do damage based on regular alpha + or - 25%. If the HE round contacts the front upper hull of the Conqueror, then the game tests for penetration. 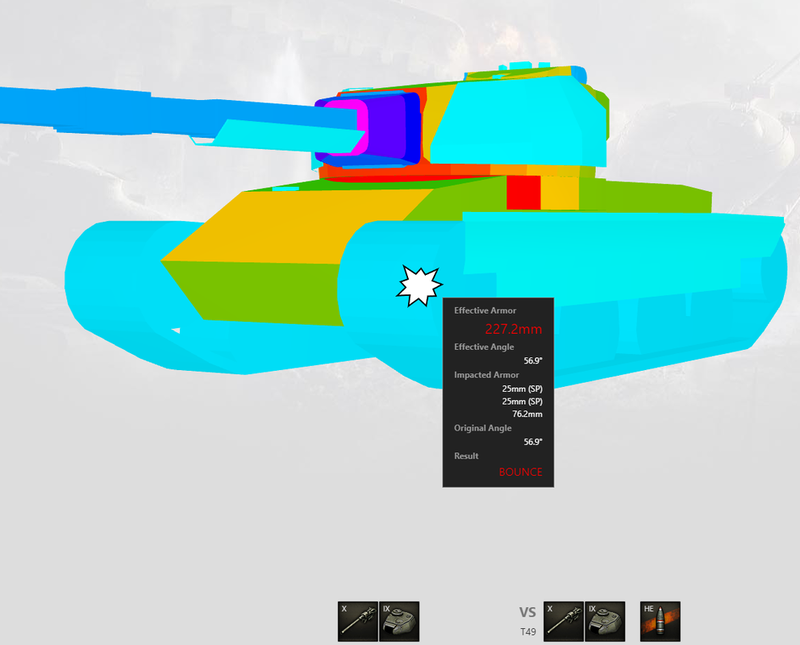 At 291 effective armor, the shell cannot penetrate and detonates on the upper hull. Rays are drawn from the point of impact to all armored surfaces with in the blast radius (direct line of sight). The game automatically chooses the ray that inflicts the most damage. In this scenario, there is no armor plate in line of sight that provides thinner armor than the plate the shell detonated on. When an HE round impacts spaced armor, the game will first test for penetration. 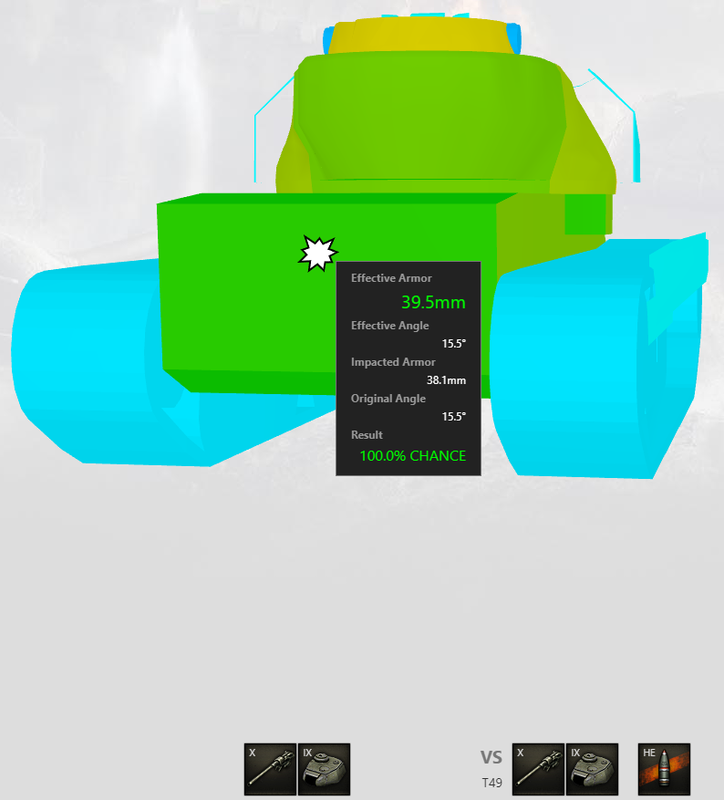 In this case the turret of the Conqueror has 14mm of spaced armor on the turret. 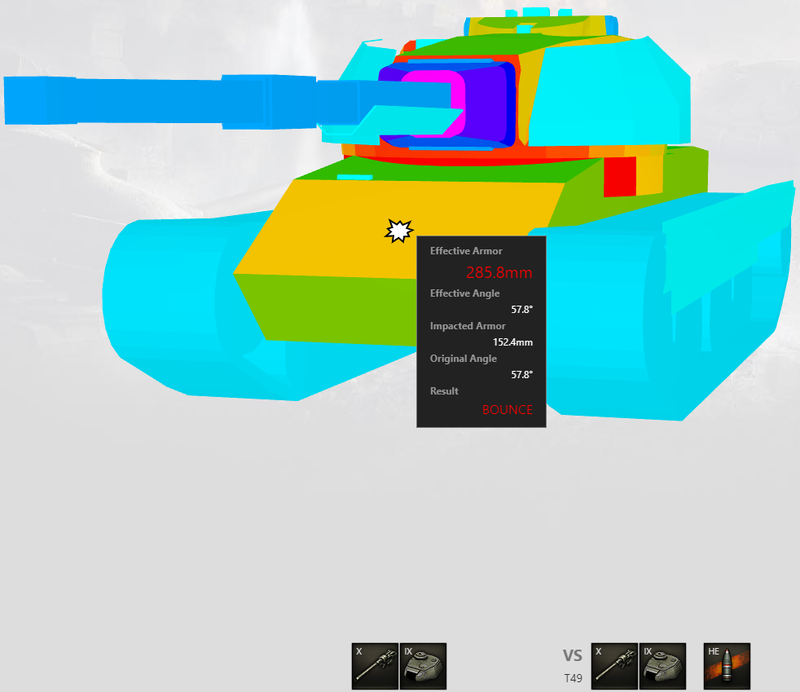 If the T49 hits it the standard HE round will penetrate this armor. Labeling this as a penetration is a bit misleading. What actually happens in the game is the HE shell detonates on the penetration point on the spaced armor. The game draws a sphere at the center of the detonation location and tests the HE non-penetration equation against all armor groups with in the spherical blast radius. If we say the shell detonates close to the bottom of the spaced armor, the thinnest armor section is directly below the spaced armor. The sphere draws a ray from the center of the detonation to the top of the hull which has an armor value of 44.5 mm. We estimate the distance from the hit on the spaced armor to the top of the hull to be 150 mm. When an HE round impacts spaced armor and fails the penetration test, it detonates on the outside of the spaced armor. The damage equation is run on this armor to see how much potential damage passes through this spaced armor. Then from the point of detonation a trace ray is drawn from this point to the main armor on the tank - this ray seeks an unobstructed path to the weakest point. A new 45° cone is drawn along this ray, and a new point is sought with in this cone that maximizes damage, and then the damage equation is run again against the hull armor. To simplify the math, we are going to assume the track wheel represents 50 mm of spaced armor, and the HE shell fails to penetrate. the distance from the detonation to the hull is estimated to be 300 mm. 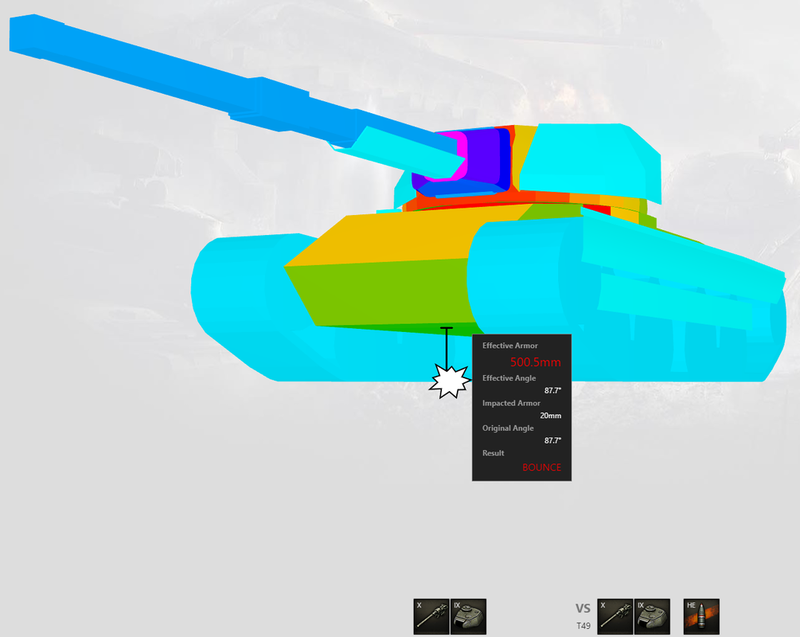 The hull armor is 76.2 mm. Second: using the remaining alpha from the first equation, we calculate the actual damage to the tank once more on the hull armor. When an HE round misses it's target, it still detonates, and any armor found with in the sphere of the blast radius will be tested for damage. In this example we will look at the scenario as though the shell flew low, and detonated just under the Conqueror. 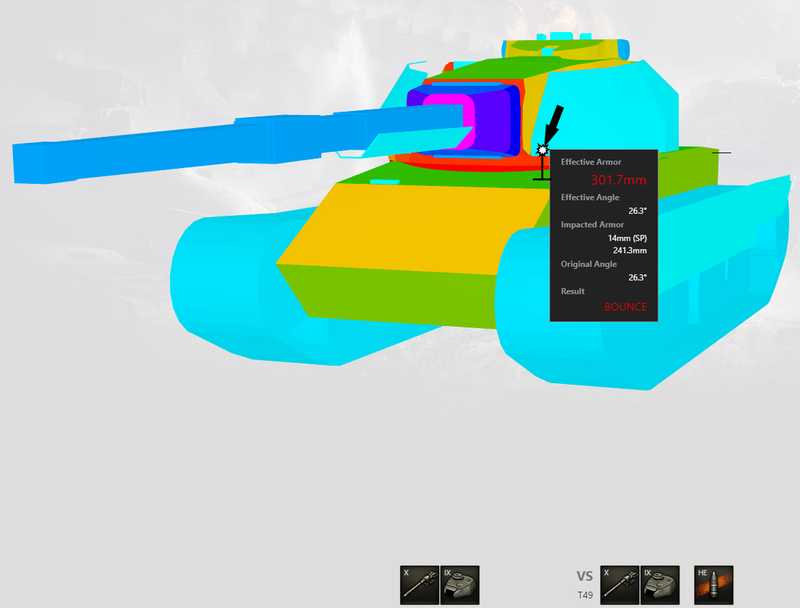 In the example the distance to the ground from the bottom of the hull was 0.5 meters, and the hull armor under the tank has a value of 20 mm. You can damage your target by ramming them! The math that drives ramming is essentially modeled as a non-penetrating HE explosion at the point of impact. The 'alpha' of this damage is calculated based on the combined weight of you and your target, and the relative speed of the impact. The Damage potential is NOT distributed evenly between the two colliding tanks. That ​DamagePotential is then split into two HE explosions, one that you suffer, and one that your opponent suffers. This is modeled by your mass relative to the combined mass. If your tank weighs 7.5 tons and you crash into a tank weighing 2.5 tons then your tank will only suffer 25% of the resulting 'explosion' damage. The resulting actual damage is then calculated based on non-penetrating HE damage at the point of impact. There are two things that modify this math. The skill Controlled impact will shift more of the DistributedDamage from you to your opponent (by up to 15%) and spall liners. Spall liners add mass to your vehicle thus also improving the DistributedDamage, and they also reduce damage you receive from the collision via the standard SpallCoefficient. Understanding this mechanic means you can reduce incoming ram damage by moving away from the ramming tank (reducing the relative speed), and pointing your strongest armor toward the rammer - forcing the impact explosion to be reduced by ArmorThickness. If you have controlled impact skill, you need to be moving for the skill to come into effect.